Working with a coalition of Britain’s leading bus companies, the Behaviour Change Lab was a two-year project to develop and test innovative ideas that encourage drivers to switch to the bus. Ethnographic research into transport behaviour showed us that it was extremely habitual. People rarely make a conscious choice on how to get from A to B, they simply do what they did last time. We therefore needed to develop interventions that could shake people out of their well worn routines. Social norms: we are strongly influenced by what other people do. If we see people like us using the bus, we are more likely to give it a try too. Trusted messengers: whether we trust and believe what someone tells us depends on who they are. If we think someone is trustworthy and knows what they are talking about, we are more likely to listen. Moments of change: most of the time we stick with our habitual ways of doing things, but there can be moments when a different experience knocks us off course and makes us more open to change. A campaign in Sheffield which aimed to reach drivers when they were open to change by targeting them at a time when the irritations of taking the car were top of mind. We used guerrilla tactics to engage them, around negative experiences such as parking, sitting in traffic or paying for petrol. 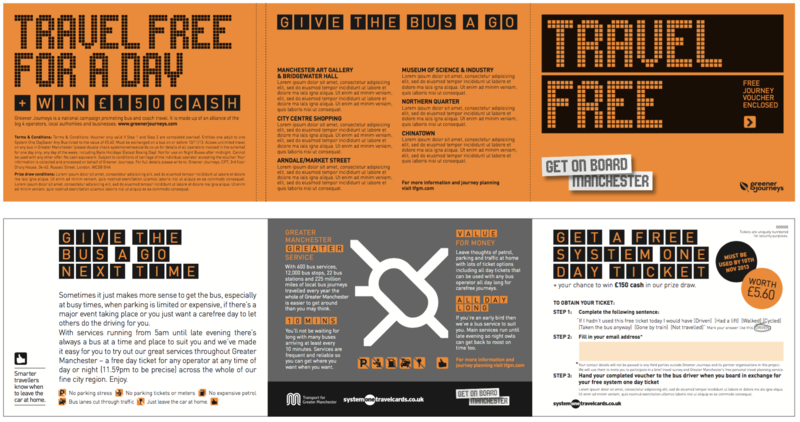 Recruiting a network of community ambassadors to promote bus travel to their friends and neighbours in Leicester. Working with three different community groups in Manchester to test how trusted messengers could be used to raise the profile of the bus within their communities. Targeting young people in Bristol with a new online tool designed to encourage them to delay the decision to learn to drive/buy a car. Each experiment was carefully evaluated and this feedback was used to bring together all our learnings into a full scale test in year two. In year two we returned to Manchester to conduct a full scale test and create a replicable model that could then be used elsewhere. Using street teams to distribute tickets for trial journeys to exploit moments of change. Working with community radio stations to offer highly relevant messaging to their loyal listeners. Partnering with a trusted community group to engage people in their local community. Our activities proved very effective at reaching car drivers who rarely used the bus. By building evaluation into the project design, we were able to accurately measure the percentage of those who redeemed vouchers who wouldn’t otherwise have used the bus that day. In Manchester this figure was 72%. 55% of infrequent bus users who had redeemed a voucher had gone on to make more trips within a few weeks. Overall, voucher redeemers were 21% more likely to use the bus again in the next few months. The learning from this activity was packaged up into a practical guide for bus companies and local authorities and many elements of this work have now been replicated elsewhere, most notably in South Yorkshire. A link to the toolkit is at the top of this page.